December 5, 2017 – Two Colorado companies designing, manufacturing and testing flight hardware for NASA’s Orion spacecraft and Space Launch System (SLS) rocket in support of human missions near the Moon and into deep space will open their facilities to media Monday, December 11. EnerSys Advanced Systems (EnerSys) in Longmont, and SEAKR Engineering Inc. (SEAKR) in Centennial are among the thousands of businesses across the 50 United States and Puerto Rico that support NASA’s deep-space exploration programs. Colorado is home to about 250 of these businesses. Visits to key suppliers are an opportunity for leadership from NASA and Orion prime contractor Lockheed Martin to share progress on flight hardware in production and recognize employees making significant contributions to human spaceflight. Media are invited to attend an employee event, a facility tour and interview NASA astronaut Nicole Mann along with other NASA, Lockheed Martin, EnerSys and SEAKR officials at either of the supplier locations. U.S. media interested in participating must contact Laura Rochon at 281-483-0229 or laura.a.rochon@nasa.gov by noon EST on Friday, December 8. EnerSys supplies the high- and low-voltage lithium-ion batteries that power the thrust vector control – or steering – on Orion’s Launch Abort System, the part of the spacecraft that can carry the crew module to safety in the event of an emergency during launch or ascent to space. EnerSys also provides lithium-ion batteries for both the core stage and exploration upper stage on the SLS rocket, critical components for a successful launch. SEAKR provides space-qualified electronics for Orion including the Vision Processing Unit, the spacecraft’s back-up flight computer and data recorder which helps process imagery taken in space and stores or sends it back to Earth during missions. NASA is leading the next steps of human space exploration with a series of deep space missions to the vicinity of the Moon, beginning with the first integrated mission of Orion — America’s spacecraft for the next generation of explorers — and the new heavy-lift Space Launch System, the most powerful rocket in the world. 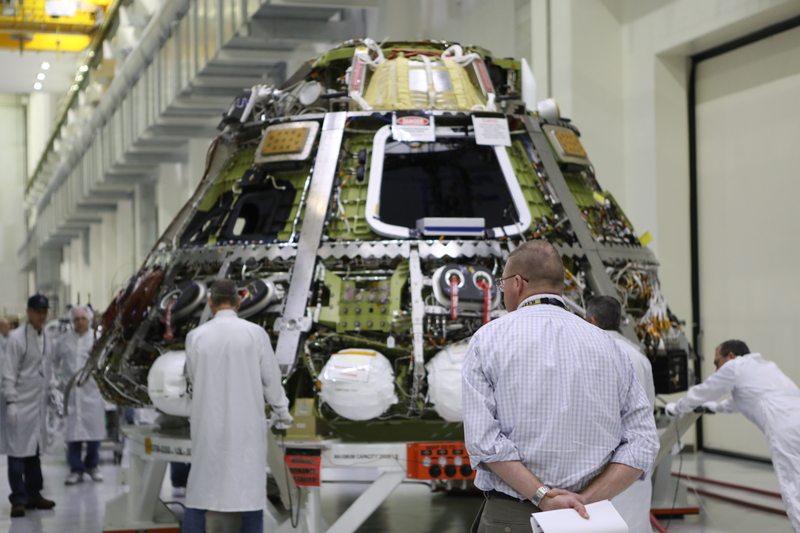 The first integrated flight test of Orion and SLS will launch from NASA’s Kennedy Space Center in Florida for a three-week uncrewed mission beyond the Moon and back. A second mission will follow with the system’s first crewed mission, which will take humans farther in space than ever before. These missions will help NASA build a flexible, reusable and sustainable infrastructure that will last for decades and support missions of increasing complexity, including to Mars.